This complex Malvasia has exceptional minerality, it is full-boded, with pronounced characteristics of the variety and fruitiness. For better quality of grapes, we have minimised the yields of our vineyards in Turkovo, located at an altitude of 350 metres. 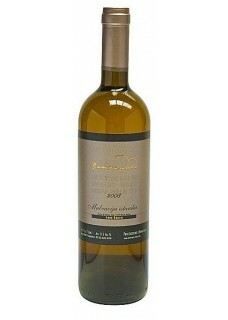 Malvazija Anno Domini was aged in oak barrels for 24 months, following a 15-day maceration. With great potential for ageing, the 2016 vintage was made in 5.000 bottles. Food pairing: Roasted meet, pasta with strong sauces. The story of the Benvenuti winery is a story of family, tradition and terroir. Situated in the quiet Istrian village of Kaldir, overlooking nearby Motovun, where they grow three grape varieties - Malvasia Istriana, Teran and Muscat. Throughout history, these varieties have been giving the best results in Istria. Family values and tradition are the key "condiments" of Benvenuti wines. They are the foundation upon which they produce wines which in their grape variety reflect the abundance of vineyards, located on several specific micro-locations. One of these, San Salvatore, is the heart of their varieties. The terraced configuration and the white soil, along with the micro-climate, give the grapes character which translates to very mineral, fresh wines, fully expressive of the characteristics of the varieties. The results of their focus on micro-locations and indigenous varieties - along with honest, hard work - are wines that are recognised by consumers, critics and peers alike.